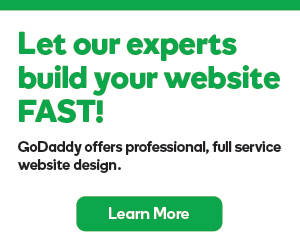 To make sure your Managed WordPress site is safe from security issues and that it's operating at the fastest speed, you should update the theme and plugins for the site when available. If your theme and plugins aren't kept up-to-date, they may not always be compatible with the most current version of WordPress. 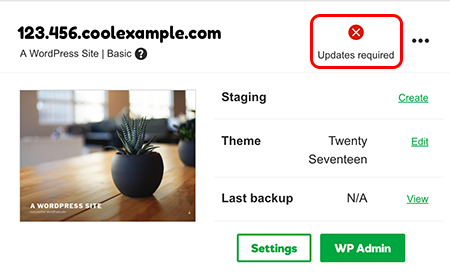 Note: If you have only one or two Managed WordPress sites, in your WordPress Sites list you'll see a notification that an update is required. If you have more than two Managed WordPress websites, you can check for updates on the site's Settings page. In your WordPress Sites list, next to the website you want to update, click the three-dot icon and select Settings. In the Updates section, a yellow warning tag next to your theme or plugins indicates that it's out-of-date. For all Managed WordPress accounts except Pro: Click Update to update a theme or plugin individually, or click Update All to update all themes and plugins at the same time. For Pro Managed WordPress accounts (available in U.S.A. and Canada only): Click Go to Updates. You'll go to the Updates page on the WordPress Dashboard for the site. Follow the onscreeen instructions to update themes and plugins.